represents an exponential power distribution with shape parameter κ, location parameter μ, and scale parameter σ.
represents an exponential power distribution with location parameter 0 and scale parameter 1. 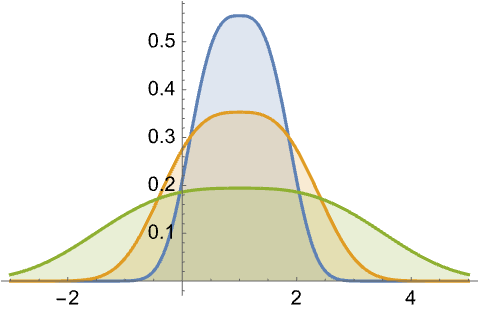 ExponentialPowerDistribution is also known as generalized normal distribution. The probability density for value in an exponential power distribution is proportional to . 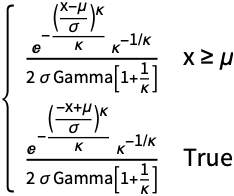 ExponentialPowerDistribution allows κ and σ to be any positive real numbers and μ to be any real number. ExponentialPowerDistribution can be used with such functions as Mean, CDF, and RandomVariate. 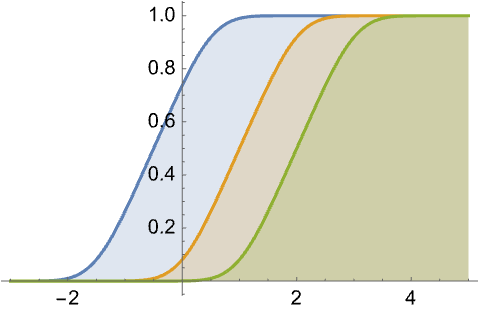 ExponentialPowerDistribution[κ,μ,σ] represents a continuous statistical distribution defined over the set of real numbers and parametrized by a real number μ (called a "location parameter") and by two positive real numbers κ and σ (called the "shape parameter" and "scale parameter", respectively). The parameter μ determines the horizontal location of the "peak" (i.e. the absolute maximum) of the probability density function (PDF) of the exponential-power distribution. While the PDF is always unimodal, the overall height and steepness of the graph are determined by the values of κ and σ. In addition, the tails of the PDF are "fat", in the sense that the PDF decreases algebraically rather than exponentially for large values of . (This behavior can be made quantitatively precise by analyzing the SurvivalFunction of the distribution.) 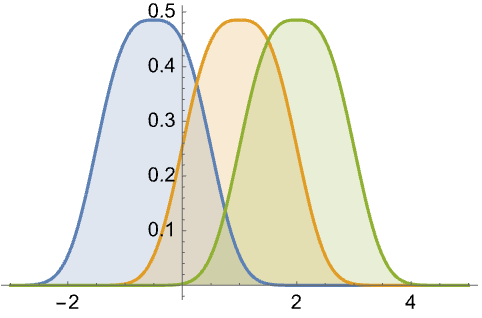 The exponential power distribution is sometimes referred to as the generalized normal distribution, though caution should be used, since the same term is sometimes used to refer to an unrelated family of nonsymmetric distributions. 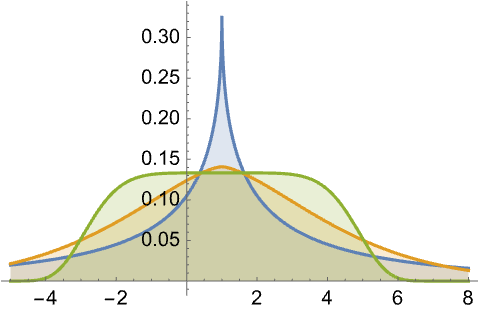 The exponential power distribution can be thought of as a generalized normal distribution (NormalDistribution) that adds a shape parameter κ, variations of which result in distributions that are symmetric but that may have larger "spreads", taller heights, and "sharp points" (i.e. points of non-differentiability). The exponential power distribution was first proposed by Robert Smith and Lee Bain in the mid-1970s as a lifetime model. It has since been used to model a number of phenomena, including survival times of patients suffering from various types of cancer, blood plasma concentration measurements of athletes, frequencies of substance fractures among materials used in manufacturing, and returns paid by financial market series. RandomVariate can be used to give one or more machine- or arbitrary-precision (the latter via the WorkingPrecision option) pseudorandom variates from an exponential power distribution. Distributed[x,ExponentialPowerDistribution[κ,μ,σ]], written more concisely as xExponentialPowerDistribution[κ,μ,σ], can be used to assert that a random variable x is distributed according to an exponential power distribution. Such an assertion can then be used in functions such as Probability, NProbability, Expectation, and NExpectation. The probability density and cumulative distribution functions may be given using PDF[ExponentialPowerDistribution[κ,μ,σ],x] and CDF[ExponentialPowerDistribution[κ,μ,σ],x]. The mean, median, variance, raw moments, and central moments may be computed using Mean, Median, Variance, Moment, and CentralMoment, respectively. DistributionFitTest can be used to test if a given dataset is consistent with an exponential power distribution, EstimatedDistribution to estimate an exponential power parametric distribution from given data, and FindDistributionParameters to fit data to an exponential power distribution. ProbabilityPlot can be used to generate a plot of the CDF of given data against the CDF of a symbolic exponential power distribution and QuantilePlot to generate a plot of the quantiles of given data against the quantiles of a symbolic exponential power distribution. TransformedDistribution can be used to represent a transformed exponential power distribution, CensoredDistribution to represent the distribution of values censored between upper and lower values, and TruncatedDistribution to represent the distribution of values truncated between upper and lower values. CopulaDistribution can be used to build higher-dimensional distributions that contain an exponential power distribution, and ProductDistribution can be used to compute a joint distribution with independent component distributions involving exponential power distributions. 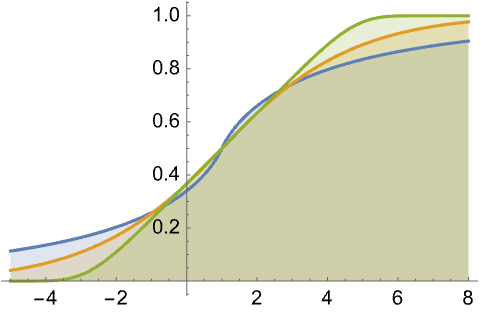 The exponential power distribution is related to a number of other distributions. 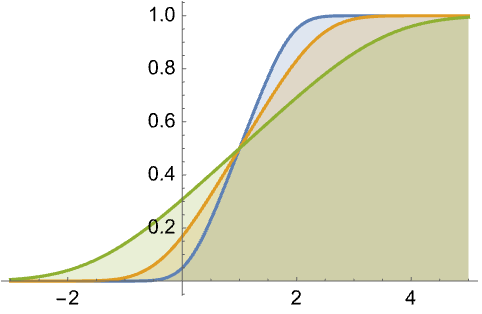 For example, ExponentialPowerDistribution is an obvious generalization of NormalDistribution, in the sense that the PDF of ExponentialPowerDistribution[2,μ,σ] is identically that of NormalDistribution[μ,σ]. ExponentialPowerDistribution also generalizes LaplaceDistribution, in the sense that ExponentialPowerDistribution[1,μ,β] has the same CDF as LaplaceDistribution[μ,β]. The distribution of length of a random vector from DirichletDistribution can be modeled smoothly by ExponentialPowerDistribution. Additionally, ExponentialPowerDistribution is qualitatively related to StudentTDistribution, ChiDistribution, MaxwellDistribution, RayleighDistribution, and RiceDistribution.